The Polish Lithuanian Commonwealth was a superpower in the 18th century world. From our post 20th century perspective, it is hard to conceive of Poland as being the strongman of Europe, but in land warfare they were as feared as the Tsarist Cossacks or Turk Janissaries– professional warriors- shock troops-who always got the job done. Know that scene in the “return of the king” movie when Gandalf comes riding down leading the Rohan horsemen- Its Tolkien’s fantasy metaphor for what happened when the Poles arrived at the Siege of Vienna in 1683 under the leadership of John III Sobieski. The formal and hereditary noble class of this military juggernaut was called the “szlachta“. Kasimierz Pulaski was a “szlachta“. His father was Starost (elder) of the area of Warka, and Kasimierz was sent to Warsaw at an early age for formal schooling and military training. He began his career as Page to the Duke of Courland, Carl Christian Joseph (of Saxony). The neighboring Russian empire dominated the Commonwealth and used its muscle to force the Polish Parliament to pass anything that the Tsar demanded. Pulaski, with others, formed a rebel group called the Bar Confederation which fought and won against the Russians- even succeeding in drawing them into a protracted war with the Ottoman Empire in 1768. This strategy backfired as victory in the conflict allowed Russia to assume control over Ukraine, the Crimean Khanate, and the Caucasus from the already deteriorating power of Istanbul. The Turks allied themselves with the Bar Federation, and Russia with Great Britain. Pulsaki’s rebellion was broken by the betrayal of the King of Poland in the end, and Pulaski developed an enmity toward the English crown for its role in his country’s destruction and subjugation. 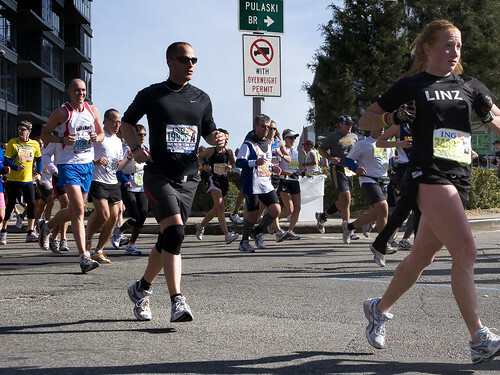 The term for their cause that the Bar Federation coined was the “Golden Liberty“. Exiled from Poland with a charge of attempted Regicide, no country in Europe would accept Pulaski as a citizen. Until word of his plight reached a certain printer from Philadelphia who was living in Paris. Over in North America a letter arrived from the Continent addressed to General Washington, one sent by his longtime colleague, the printer turned diplomat named Benjamin Franklin. In it Pulaski is introduced “as renowned throughout Europe for the courage and bravery he displayed in defense of his country’s freedom”. Accepting the recommendations of Franklin, the American Augustus invited Pulaski to join the cause, and offered him a chance at vengeance upon the British allies of his mortal enemies- the Russians. Pulaski declard “I came here, where freedom is being defended, to serve it, and to live or die for it.”. At the Battle of Brandywine, Pulaski’s quick thinking and battlefield hardened experience saved Washington from defeat and death. Elevated to Brigadier General of the Cavalry, Pulaski used his own fortune to arm his men when Congress was slow in funding them. He is credited as being the father of the American Cavalry, and was instrumental in creating the system of practice drilling, training disciplines, and martial customs which have long been a distinction of the American Cavalry ever since. At the Siege of Savannah in 1779, Pulaski was hit by grapeshot and died of his wounds. There is debate over his resting place, but I favor the notion that he was buried at sea (just for the romance), but those in the know believe him to lie in Savannah, Georgia. In 2007, the US Senate got around to declaring Kasimierz Pulaski a citizen of the United States, but the bill still needs to pass the in House of Representatives and be signed by the President to become official. 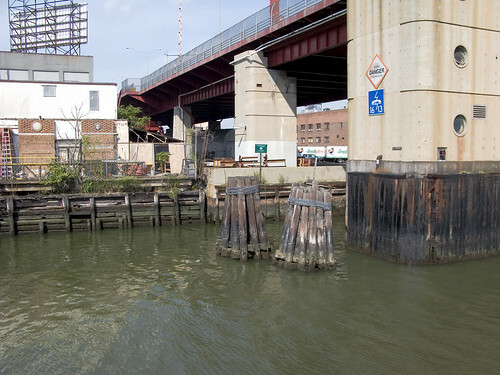 So, to celebrate this swashbuckling prince of Poland, who was instrumental in the transformation of the Colonial Army from a peasant brigade to an army that could fight the British, New York City named a bridge over Newtown Creek after him. 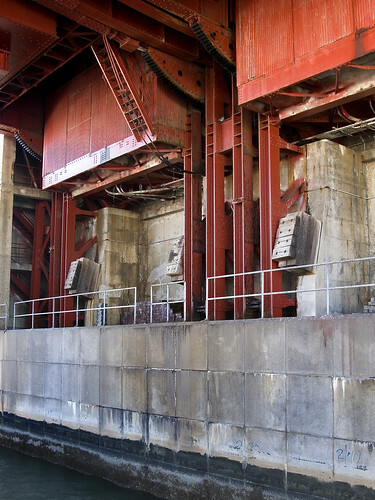 A bascule drawbridge of paralell counterweight design, the Pulaski Bridge was overseen by New York City Commissioner of Public Works Frederick Zurmuhlen, and the general contractor was the Horn Construction Company, with steel and expertise supplied by Bethlehem Steel. 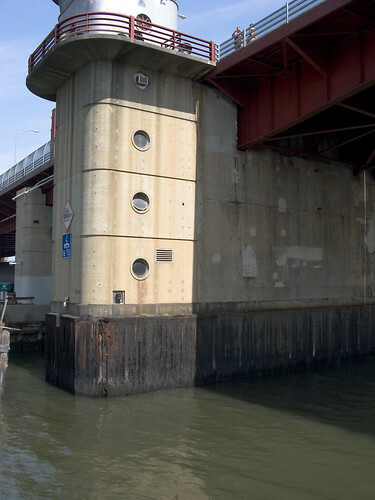 It opened in September of 1954 at a cost of $9,664,446.25- a reconstruction of the bridge in 1994 cost $40 million. 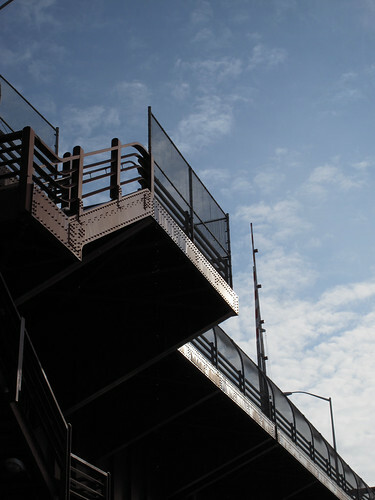 It carries six lanes of vehicular traffic, and is a primary link between north Brooklyn and western Queens. 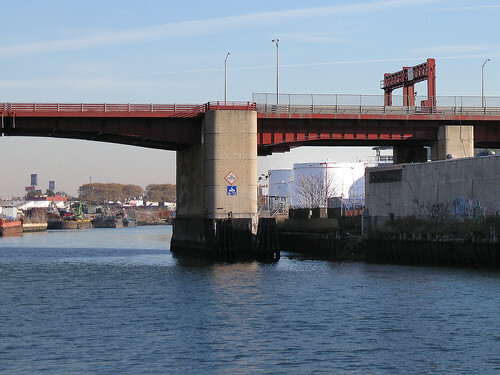 It is the first bridge one encounters when entering the Newtown Creek, and it is oriented on a north south vector over the aqueous surface. 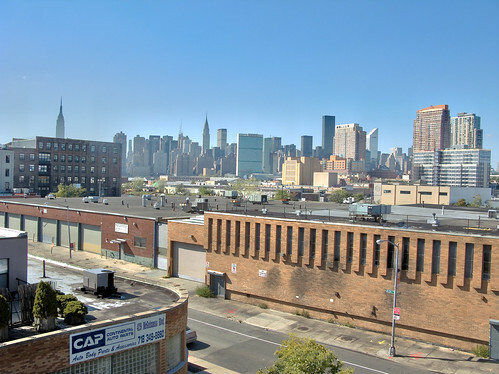 It connects fabled Greenpoint in Brooklyn to the tangle and enigma of Long Island City in Queens. 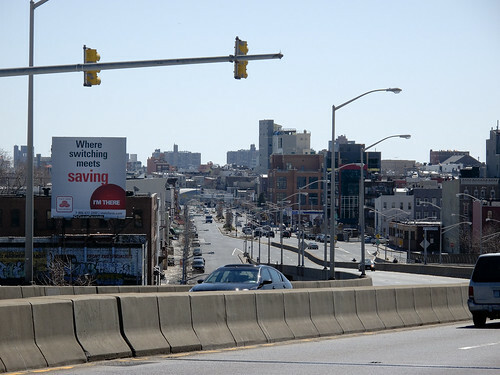 McGuinness Boulevard approaches the bridge from the south and Eleventh Street from the north. It has two 10.5m roadways divided by a concrete median barrier. It also carries a 2.7m pedestrian sidewalk. 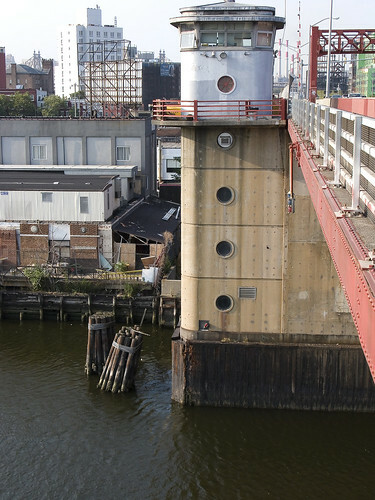 The bridge provides a channel with a horizontal clearance of 45.7m and a vertical clearance of 11.9m in the closed position at MHW and 13m MLW. 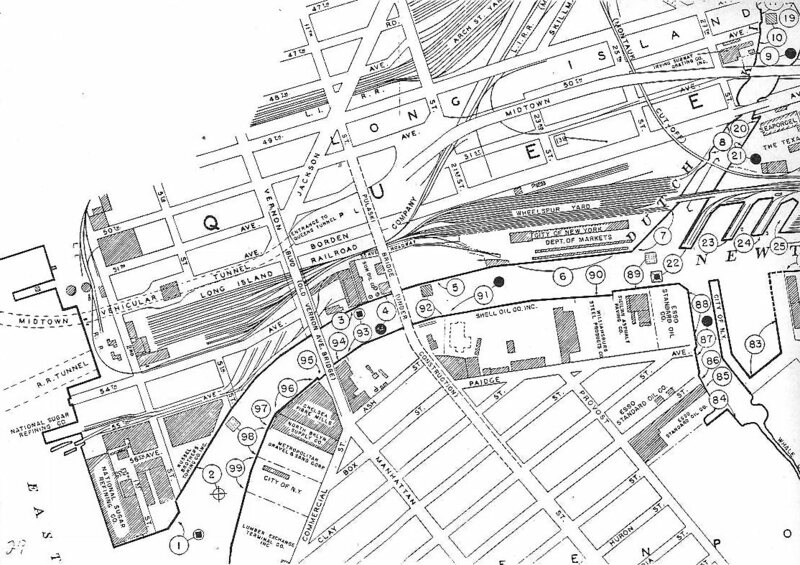 In this late 1940’s map at trainsarefun.com, the old Vernon Avenue Bridge is still in place, and the Pulaski is still under construction. 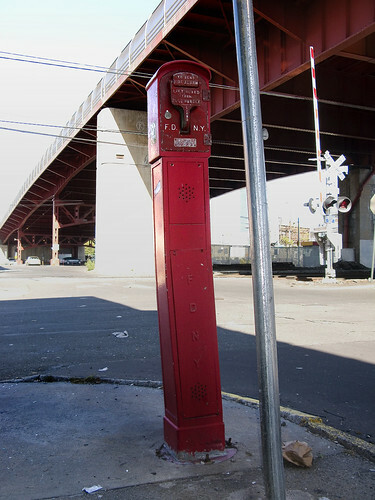 There are only seven available colors approved for bridges to be painted with in the City of New York, which are defined by the Public Design Commission as Deep Cool Red, Federal Blue, George Washington Bridge Gray, Aluminum Green, Pulaski Red, Munsell Gray or Dark Green. Its sort of obvious what color Pulaski Red is. 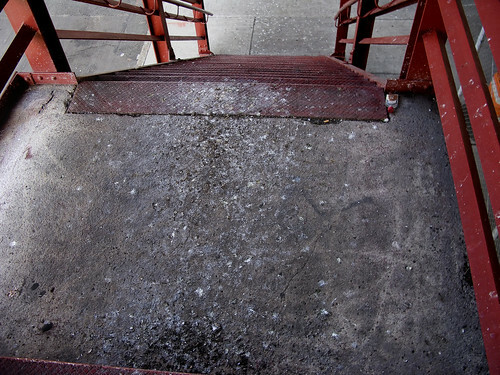 I make it a point of not touching the Pulaski Bridge with anything other than the soles of my shoes. 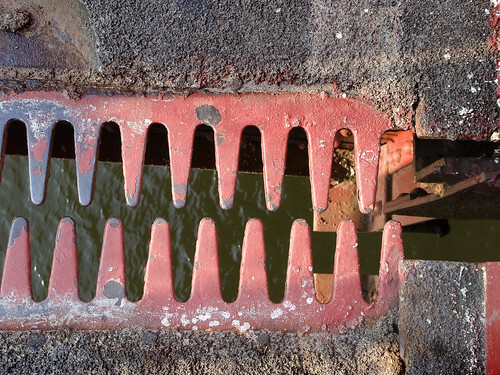 There is a thriving colony of pestilential fowl living in its rafters, and they delight in painting the bridge according to their own fecund taste. I also make it a point of walking through wet grass and puddles on my way back home to the noble hills of Astoria. 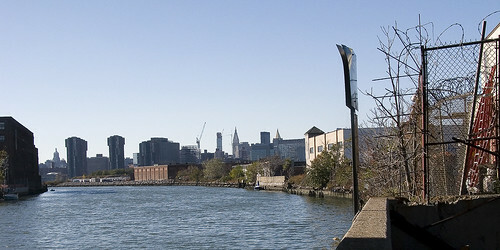 The Bridge has similar staircases at either side of the Newtown Creek, which allow access to the combined pedestrian walkway and bicycle lane. 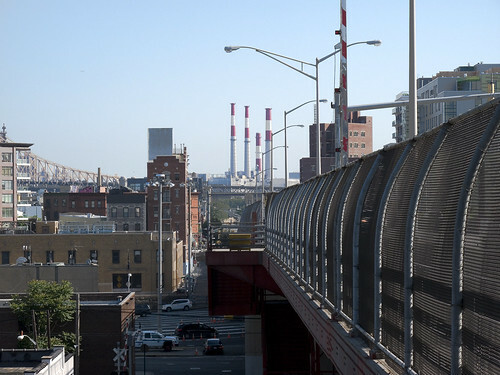 Looking due north, one sees Big Allis, The Queensboro bridge, and the toll plaza of the Midtown Tunnel. 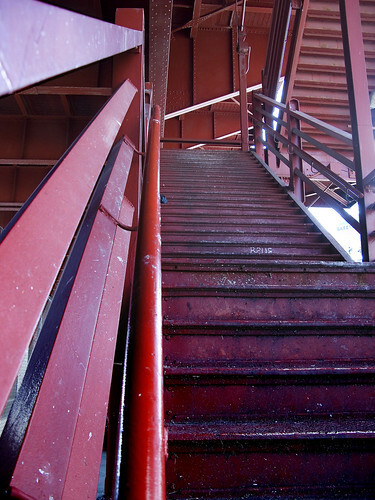 This pathway also offers commanding views of Manhattan due west. Problematic encounters between speeding bicyclists and pedestrians have become a common experience for Newtownicans on this walkway. The visible affair is obviously in need of remedy, before a collision results in tragedy. 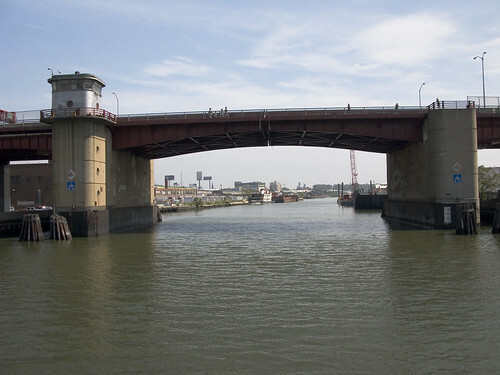 Incidentally, the Pulaski Bridge is the 13.1 mile point in the New York Marathon, for which it is closed to vehicular traffic annually. This shot is from 2008. Looking down, on the Queens side. 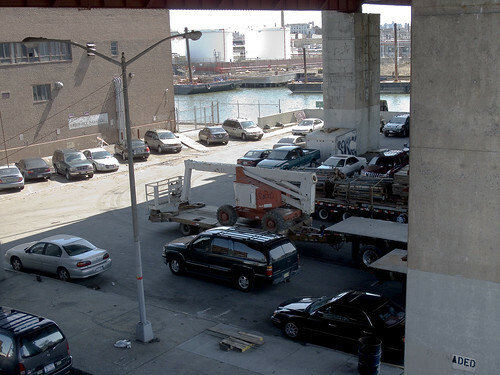 The area under the bridge is used as a parking lot by the employees of area businesses, like FreshDIrect on Borden Avenue- whose operation is located directly eastward on the shore of the Newtown Creek. 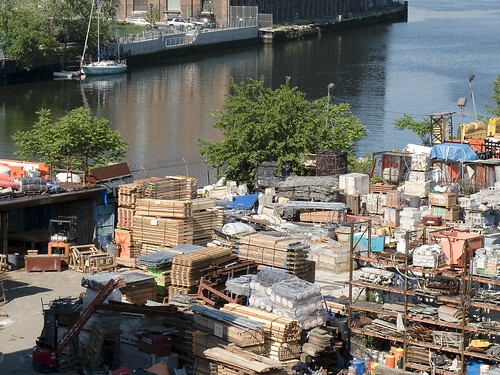 To the West, an open air warehouse directly on the Newtown Creek bulkheads. 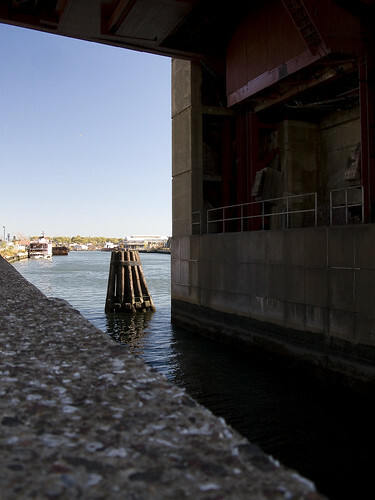 At the water’s edge, one can gain a unique vantage point looking west toward Hunters Point. 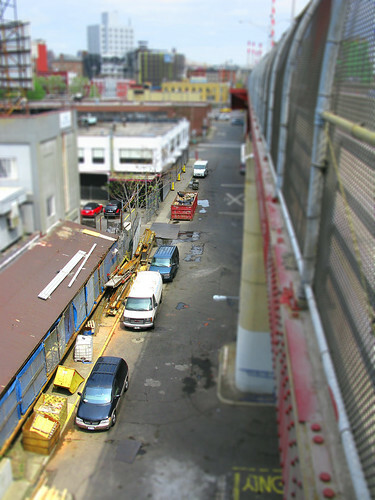 The bridge’s works, from the Queens side. Notice the high tide sludge line on the moorings. 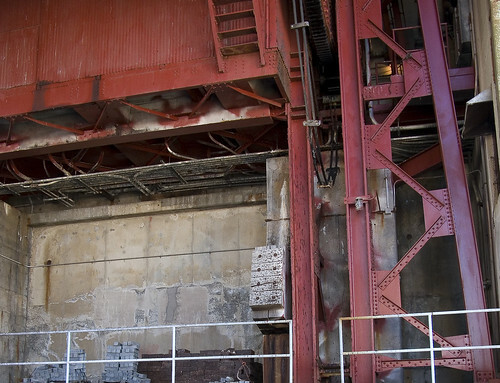 From this vantage, you can visualize the catwalks and ladders hidden within the superstructure of the bridge. The first thing you’ll notice is that this is where the DOT parks part of their truck fleet. Don’t forget to look the other way though, the view is a stunner. Lords and ladies of Newtown, this has been the Newtown Pentacle introduction to DUPBO. 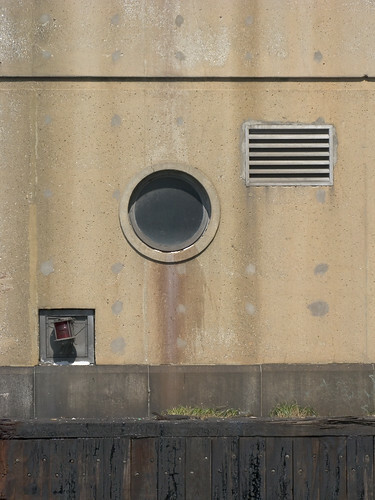 « The Terracotta House, or… what is that? 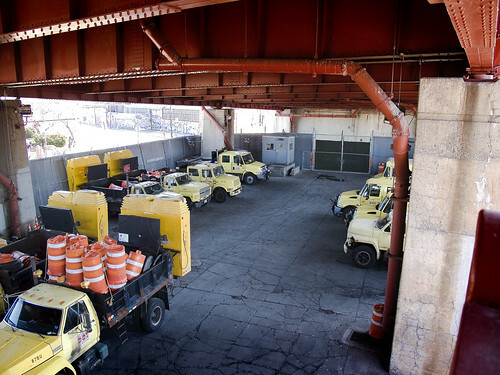 FYI, Port Authority police does not patrol the Queens – Midtown Tunnel, those are TBTA Peace Officers, MTA cops patrol the LIRR tracks you were referring to.